We are delighted to announce some staff promotions within our London office. Rob Williams has been promoted to Associate. He began his career at Powell Dobson's Cardiff office in 2007 where he was an integral member of the residential studio for the duration of his university studies. In 2011, Rob rejoined Powell Dobson and qualifed as an Architect in 2014. 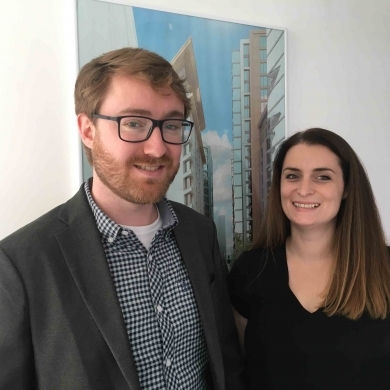 Upon qualification Rob relocated to our expanding London studio, taking with him his extensive experience of working for both private developers and affordable housing providers. Melanie Humphreys has also been promoted to Senior Architect. She has been with Powell Dobson for over 6 years and has gained extensive experience in the residential sector. She is a confident communicator, presenting to clients and organisations and manages public consultations. Prior to joining Powell Dobson she gained a broad experience at practices in Newcastle where she worked on retail, leisure and residential masterplanning schemes. Melanie uses her initiative to bring a positive attitude to all projects that she works on and champions good working relationships with all consultants, contractors and clients. We wish them both every success in their new roles.